Yesterday afternoon my daughter found my February issue of Real Simple magazine lying on the kitchen counter. 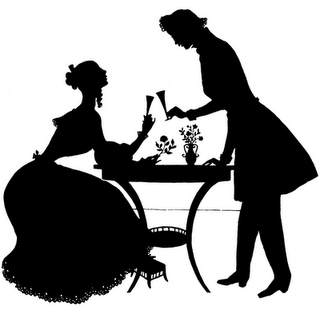 It was opened to the no-obligation Book Club page which was asking readers, “Who is your favorite fictional couple?” As Lovey breezed through the article, she made comments like “Oh, yes, definitely Jane Eyre and Mr. Rochester”, and “This lady called Mr. Darcy a pompous jerk!”(said with a giggle). This little article sparked a lively discussion of who our favorite fictional couples are. In celebration of Valentine’s day, I thought I’d share the couples that landed at the top of our lists. If you’d like to join in with your own favorites, please feel free. Anne Elliott and Captain Frederick Wentworth – I love Jane Austen. I’ve read all of her novels many times – they are comfort food in the form of books to me. While I enjoy the antics of all the couples as they decide whether or not they truly love each other,I find the story of Persuasion’s Anne and Captain Wentworth is just a bit different. They’ve already been very much in love. But when Frederick Wentworth, who had little money, quietly asked Anne, who was very wealthy, to marry him, she refused based on the advice of a family friend who felt he simply wasn’t good enough. Years later, Anne, who is still filled with regret, is living at home with her vapid father and sister, wasting away into spinsterhood. Certain circumstances bring Anne and Frederick back together and their situations have changed considerably. Frederick is now a Captain of his own ship with plenty of money and Ann’s family has fallen on very hard times. Even though there are misunderstandings and hurt feelings, the constancy of their love finally brings them together in the end. The 1995 version of the movie does a great job of depicting their quiet struggles, Anne’s hope, and their final reunion. So. Very. Romantic. Jane Eyre and Mr. Edward Rochester – If I were forced to pick only one fictional couple, Charlotte Bronte’s creation would be the one. I love Mr. Rochester for treating Jane with dignity and equality after her horrid upbringing. Jane is a breath of fresh air for Mr. Rochester with her quiet but passionate temperament. They build a relationship based on friendship, mutual respect, and desire. The fact that their story is tumultuous just adds to the drama. I read the book after seeing several versions of the movie and came to love these characters even more through the written word. I ask you, how can anyone watch Ruth Wilson and Toby Stephens and not believe that Jane and Mr. Rochester are the most passionately devoted couple ever brought to life on the pages of a book? Romeo and Juliet (William Shakespeare) – required reading in 9th grade but my swooning little romantic is way ahead of the game. Elinor Dashwood and Edward Faris (Sense and Sensibility by Jane Austen) -Hugh Grant plays such a fabulously awkward Edward. However, Lovey would like to make it clear that Edward is not quite so awkward in the book. I concur. Buttercup and Wesley (The Princess Bride by William Goldman) – As you wish…. Katherine Earnshaw and Heathcliff (Wuthering Heights by Emily Bronte) – I have to mention the obsession issues. Lovey just shakes her head. In all fairness, I have not read the book and she has so she probably knows what she’s talking about. Jane Eyre and Mr. Edward Rochester (Jane Eyre by Charlotte Bronte) – Please see detailed description above. Lovey is in complete agreement. A cursory glance at my 50/50 book list would verify that I don’t generally read books strictly for romance. I prefer a expertly woven story with interesting characters that I can identify with. If a believable and juicy romance is interwoven through the fabric of such a story, so much the better, then. It’s delicious icing on an already soul-satisfying cake. Happy Valentine’s Day!